Welcome to another wonderful round of Bright Ideas! I am so excited to share this wonderful website with you today to help you celebrate April and National Poetry Month! Have you heard of ReadWriteThink.org? If not, you will be incredibly amazed at all of the free resources available to you all year long. But the times we love using it as a class the most is creating wonderful poems using their Student Interactive Poetry resources! If you click HERE (or on the picture above) you will be taken to a list of all of their interactive resources. These are appropriate for K-12 with differentiated lesson plans for each of the levels. The only requirement is to have Flash installed on your computer which is a free download from Adobe. Your computer will let you know if you need an updated version and/or the program, with a link to the site to download directly if you don't already have it. Easy peasy! From there, my kids would go nuts trying out the different styles! I usually tried to present one different style every other day and then allow them to experiment with up to three styles at the end of the week in Computer Lab where they could access each of the interactives. Each type of interactive begins with a description and example, then moves into a planning activity for the student's topic of choice. The plan then moves into the next screen which allows the student to manipulate the words and phrases into a poem that fits the style. At the end, the poem is complete and there is an option to print, save as a PDF, or email! I typically link to these interactives straight from our classroom website since students love them and want to continue making them at home. You can easily include them as a homework assignment and have them email finished poems to you, or print and turn them in the next day. ReadWriteThink.org also includes classroom, parent, and even community resources to extend these lessons far past the interactives. These became a quick and, best of all, fun way to explore and experiment with many poetry forms during the month of April. We especially loved making them for our first grade buddies to share. If you enjoyed this bright idea, please consider joining me on Facebook, Instagram, or Twitter for more great ideas. This is so cool Stephanie!!! I knew of the site, but not the poetry part! Thank you so much!! I love this site! Such a great tip, Stephanie!! Thanks for sharing resources from ReadWriteThink.org - we appreciate it! I also wanted to let you know that we pay educators for their lesson plan and teaching ideas. Let me know if you would like more information! Love, love this idea. I'm currently working on poetry with my 3rd graders, when we aren't taking the state test. 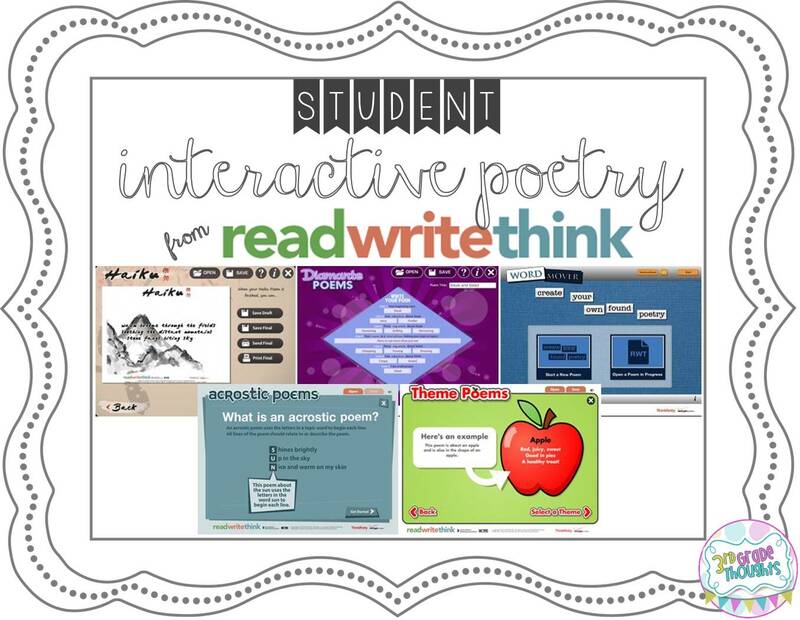 I've used Read, Write, Think many times, but I didn't know about the interactive poetry features! Great find!